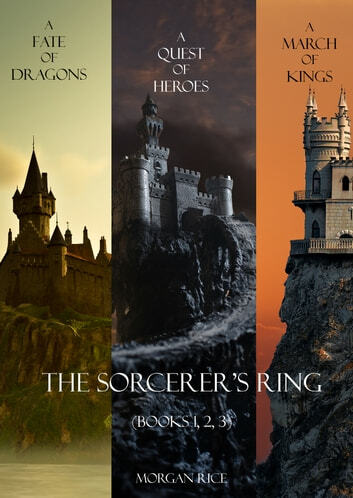 This bundle includes the first three books in Morgan Rice’s #1 Bestselling fantasy series THE SORCERER’S RING (A QUEST OF HEROES, A MARCH OF KINGS and A FATE OF DRAGONS). These three bestselling novels are all here in one convenient file. It is a great introduction to the SORCERER’S RING series. Over 200,000 words of reading, all for an incredible price! It is a great deal, and it also makes the perfect gift! The series tells the epic tale of the coming of age of Thorgrin, a special 14 year old boy, the least loved of his father, as he strives to become a warrior in the magical Kingdom of the Ring, and as he learns he has powers, and a destiny, he does not understand. An outsider, he must fight for acceptance as he strives to join the King’s elite Legion, and as he falls in love with the king’s 16 year old daughter. Most of all, he must learn who he really is, why his destiny is so important, and why the entire fate of The Ring depends on him. Books #4--#15 in the series are also available! The story is fun to follow and the characters are endearing in their own quirky ways, but it seems to me whomever edited these books was sleeping on the job. There were too many instances when errors in grammar, tense, and spelling took me completely out of the story and made me thankful I didn't pay full price for this trilogy package. I've really enjoyed these books the author keeps you gripped by the events.pity they are short and that when you start getting into the story it comes to an end. l really enjoyed all 3 books, 1 2 3 & i can hardly wait till i start reading 4 5 & 6. Also i like to mention Morgan Rice,keep up the the good work ! !